Charging stations for electric cars could be in place at four state Thruway travel plazas by Memorial Day weekend. 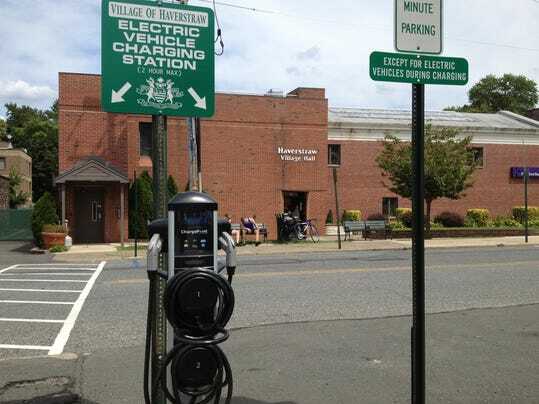 The fast-charging stations — able to fully charge a car in 35 minutes — would be located between Newburgh and Albany, Acting Director of Maintenance and Operations Maria Lehman told Thruway board members at their monthly meeting Thursday. "We want to be able to encourage electric vehicles on the Thruway," Lehman said. "But these tend to be cars that are not used for long distances, so this is uncharted territory." Northbound drivers would be able to juice up at the Plattekill travel plaza, between Exits 17 in Newburgh and 18 in New Paltz; and Malden (Exits 20 in Saugerties and 21 in Catskill). Southbound, they would stop at Ulster (Exits 20 and 19 in Kingston); and Modena (Exits 18 and 17). The Thruway Authority is partnering with the New York Power Authority on the pilot program. Lehman said many details still have to be worked out, including prices and how many outlets each station will have. The stations would be DC Level 3, some of the fastest in the market and the first to be installed in New York state. Most electric cars will easily be able to connect to them, but Tesla models will need an adapter, which most owners already have, Lehman said. The range of a charged electic vehicle varies widely. The pilot program is part of Gov. Andrew Cuomo's Charge NY initiative to create a network of up to 3,000 public and workplace charging stations across the state. New York has fewer than 1,000 charging outlets at 432 public and private stations, according to the U.S. Department of Energy. Of the 38 charging stations in the Lower Hudson Valley, several are in White Plains, Montebello and Haverstraw village. Thruway board member Brandon Sall wondered why charging stations weren't being installed at travel plazas in Rockland and Westchester counties. "Hopefully it's enough for someone to get from Manhattan to Ulster," said Sall, adding "It's really positive news and we should share it with everyone."